On a cold, sunny day in November, a photo by Bruce M Walker on Flickr. Lady of the Lake, a photo by Bruce M Walker on Flickr. This was taken fully 45 minutes after sunset, looking out onto Lake Ontario from east of Port Credit. Just proves that it's worth waiting for those deep colours. Lighting: 30" umbrella softbox with Pentax AF540FGZ flash, on monopod right. Bare Pentax AF540FGZ flash, handheld left. Steampunk Warrior, a photo by Bruce M Walker on Flickr. From a creative shoot with photographer-turned-model Atalanta Fugiens. She approached me to get some experience on the other side of the lens to help with her own photography. I borrowed an idle exercise space, enlisted Yurie Oka, a talented MUA and hair stylist, and out came the corsets. Elegance, a photo by Bruce M Walker on Flickr. From a creative shoot with photographer-turned-model Atalanta Fugiens. She approached me to get some experience on the other side of the lens to help with her own photography. I borrowed an idle exercise space, enlisted a talented MUA and hair stylist, Yurie Oka, and out came the corsets. Therapy Ball, a photo by Bruce M Walker on Flickr. Gabrielle Neveu, a photo by Bruce M Walker on Flickr. Gabbi is the owner of The Trap Door in The Junction, Toronto. She sells clothing and accessories "for the artistic professional". I shot this portrait with one light, a 30" octa umbrella softbox with a Pentax flash, left. Will work for a brush, a photo by Bruce M Walker on Flickr. Lighting: Pentax AF540FGZ flash in Westcott Medium 28" softbox, right. Bare Pentax AF540FGZ flash hair/kicker clamped to background stand, left. If you need a way to hang a photographic studio backdrop, don't have an official backdrop support system but do have a couple of lightweight lighting stands spare, here's a way you can do it for under ten bucks. 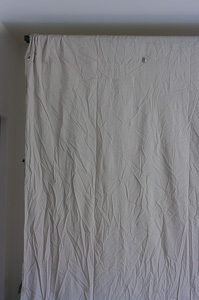 This will handle a roll of seamless (five feet or nine) or a sheet of muslin like I'm using. And see the last section for an even less expensive ($5), though less portable, option. 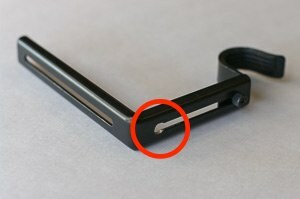 Using the file, you must file a one quarter inch "keyhole" into the slot in one side of both the Betydlig curtain rod hangers, to fit them over the one quarter inch threaded bolt on top of the light stands. I recommend doing this to the shorter slot closest to the corner, which you can see to the right, with the curtain rod support in place. Expect to spend about 5 minutes filing each hole -- it's kinda tedious. By the way, the 1/4" bolt (stud) on the top your light stands may be hidden inside a black plastic knob that you unscrew to reveal. After you have enlarged the holes at the end of the existing slots and verified that they fit over the light stand studs, assemble the Betydlig curtain rod hangers as you see in the picture above. Be sure to stick the thinnest rubber grip (included with the hangers) into the curved hanger bracket. 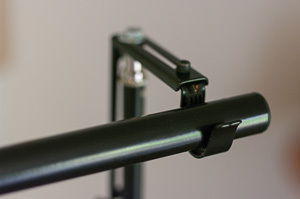 Using the 1/4" nuts and washers, attach the brackets on top of two light stands, as shown to the right. If you substitute wing-nuts for the hex nuts you'll be able to add and remove this from your stands more easily by hand. 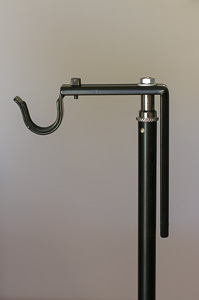 Set your light stands with shiny new backdrop hangers an appropriate distance apart, eg 6 feet for 5-foot seamless or 10 feet for 9-foot seamless. Raise both stands to about head height. Thread the roll or muslin through the curtain rod and extend the rod a little longer than the distance between the stands. Lift it up and settle it into the hangers. Now you can lift first one side, then the other up to the ceiling or the maximum height of your stands. You might need an assistant to help you in raising a heavy roll of seamless. You should use the tallest stands you have available to avoid having the top of the backdrop be visible in your shots, especially full-length standing shots. 8-foot would be great. Be careful to make the stands as stable as possible. Orient their legs so the longest one is under the weight of the backdrop material and pointing forward into the room. This will avoid the stands falling when you roll out the seamless or tug on fabric. You may want to sandbag the stands for additional stability. Now shoot away. 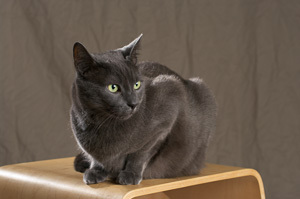 You should end up with something like this nice picture of Gandalf, my Russian Blue. You can still use the stands for holding some lights by clamping grip gear to the vertical posts. For instance in my cat portrait I attached a bare flash as a kicker/hair-light using a Lowel Tota-Clamp and an umbrella mount on the left backdrop stand. Thanks to a suggestion I received from Lumigraphics on Model Mayhem, you can do it for under $5 with a piece of ten foot EMT thin wall conduit and two HDX 2-inch clamps from Home Depot. Sit the clamps on top of the stands pointing up and drop the conduit into their jaws. This isn't portable, but it's sure cheap. Chairman of the board, a photo by Bruce M Walker on Flickr. A one-light portrait: a single 30" octa umbrella softbox right. I got lovely rim lighting from a number of north-facing windows above and to either side of my subject. I dragged the shutter to 1/40th sec to take advantage of that, and bring up the background just enough. Nico Skellington, a photo by Bruce M Walker on Flickr. Metropolis Factory is housed in an old power station where they create industrial themed furniture and sculpture from recycled, vintage and found materials. Besides workshops and showrooms, the building is also a large event hosting space. K20D, DA* 16-50/2.8 @ 31mm/f:5, 1/180th, ISO 640. AF540FGZ on camera with StoFen white diffuser. 6-in-1 reflector, a photo by Bruce M Walker on Flickr. Taffy is seen here treating my photo-gear with respect. She also demonstrates that this 5-in-1 reflector is actually a 6-in-1 reflector. Artisans of the Metropolis, a photo by Bruce M Walker on Flickr. Part of the interior of Metropolis Factory as seen during their Artisans of the Metropolis event. It's a fascinating place with strange and wonderful vintage industrial artifacts, original and repurposed, everywhere you look. Shot on location in my sister's living room. Strobist: Pentax AF540FGZ flash in Westcott Medium Apollo above-left; AF540FGZ in 30" umbrella softbox, behind-right; bare Pentax AF200 on background; silver reflector right; aluminum baking dish handheld below for fill (ran out of reflectors!). Dead All Night, a photo by Bruce M Walker on Flickr. Louise and I met and interviewed three of the cast and crew of the just-released (August 2013) Canadian independent short film Dead All Night, a science fiction post-apocalyptic action thriller. L-R: Bethany McLeod - Art Direction; Christopher Giroux - Director, Writer, Producer; Kyle William - actor: The Veteran. Louise handheld a bare Pentax AF540FGZ flash camera-left. Sunset by the sea, a photo by Bruce M Walker on Flickr. Same evening as "Getting some air". Taken 30 minutes after sunset, it was cold and gusty, but the most marvelous colour. Getting some air, a photo by Bruce M Walker on Flickr. My niece Sophie doing some athletic leaps down by Lake Ontario last evening. 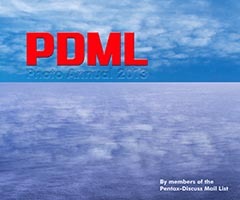 Lr + Ps + Nik. Zoey Adams, a photo by Bruce M Walker on Flickr. Of the jazz group Paper Moon. With Tony Quarrington guitar, vocals and Tony Laviola upright bass. At Toronto's Gate 403 restaurant August 4, 2013. Ivory silk, obverse, a photo by Bruce M Walker on Flickr. Ivory silk panicle in a blue vase, a photo by Bruce M Walker on Flickr. The Brawley, a set on Flickr. I shot these for The Brawley Restaurant and Lounge newly opened in Etobicoke, Toronto. They'll be used for their website and promotional material. That smell! What did they do to you? That smell! What did they do to you?, a photo by Bruce M Walker on Flickr. On delivery, a photo by Bruce M Walker on Flickr. More street photography in Toronto's Junction area. Kanzan Dusk 2, a photo by Bruce M Walker on Flickr. Celebrating our flowering Kanzan Cherry tree last week. With recent cold weather and rain the petals are all starting to fall now. I lit this with a Pentax hotshoe flash (AF540-FGZ) off-camera in a 36" umbrella softbox. I added a green gel to the flash and colour-corrected in Lightroom. That increased the reds & pinks in the sky. Dark roast, a photo by Bruce M Walker on Flickr.